SoftPlanet makes it possible for everyone to get free Quelea download directly from our servers. There is no registration needed for downloading. Quelea version 2014.0 is a free and useful software product, developed as a open-sourced song projection program. It is mostly used in churches. 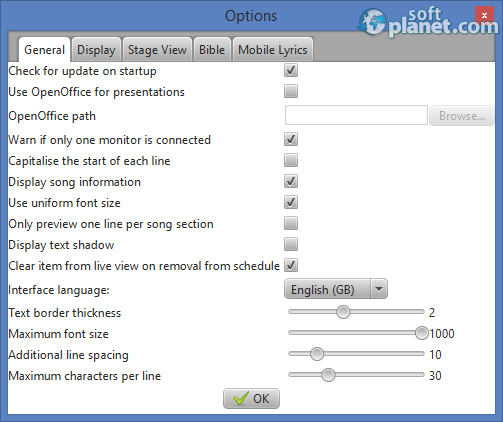 However it can be used for making live presentations or even playing video files. Unlike its previous versions, this particular one doesn't require JRE to be installed, because it is now bundled alongside the application. 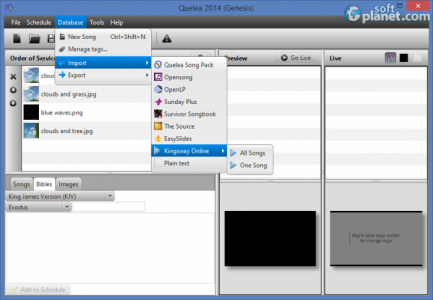 Quelea seems to be a very reliable software solution for church song projection as well as making presentations and playing videos. It is 100% free of charge, so you don't need to hesitate any more, but download it right away. Our security scan shows that Quelea is clean from viruses. The current version of Quelea has been scanned by our system, which contains 46 different anti-virus algorithms. That ensures that Quelea 2014.0 is 100% safe for your computer.